"[Life sentences] are whatever we make up as children in moments of what is - for a child - real stress or threat. If you do everything to get those life sentences out of your future, you can create something." This essay, Seeking Approval: The Watermelon Basket Incident, And More, is the companion piece to Authentic Truth: The Coca Cola Animals Incident, And More. It is also the sequel to Dealing With Tribulation. It's not what happens that causes trouble. Trouble is almost never caused by what happens. It's what we make up about what happens that foments trouble. When I was young, too young to know any better, certainly too young to realize I was doing it, I made up stuff about whatever happened. More sophisticated ways of saying "made up stuff" are "interpreted", "added on meaning" etc. There's nothing sinister about adding on meaning. Given we're meaning making machines, it's what we do. Adding on meaning is the lizard brain's way of cataloging the responses we need to survive. This adding on meaning isn't only for young people. All human beings add on meaning. Then we forget it's we who added on the meaning. And having forgotten it's we who added on the meaning, we then live as if whatever meaning we added on, is "the Truth". That's hazardous. And the hazard is magnified the earlier we begin, given there are more years ahead for its impact to shape us. Listen: it shapes us for the rest of our lives ie it's a life sentence. So by adding on meaning, we sentence ourselves to an erroneous future based on a misinterpreted past. And the earlier we begin adding on meaning, the longer the erroneous future we'll live into, will be. It's a watermelon carved into the shape of a basket. 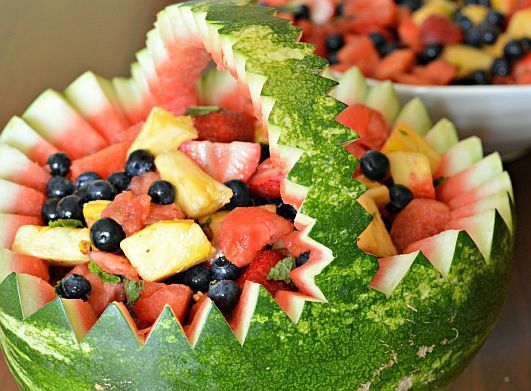 And it's filled with fruit: grapes, pineapple, strawberries, and watermelon. My eyes get big. I walk over to it. My little heart says "Ooh! Wow!". It looks so beautiful. I figure it will be great to carry it over to all the moms and offer them some fruit to eat. So I reach over and pick it up by the handle, the same way you'd pick up any basket. I'm smiling and happy. I'm excited to be a big boy offering the moms something to eat ... and at that very moment the handle breaks under the weight of the fruit, and the watermelon basket crashes to the floor, bursting, sending pieces of fruit and juice everywhere. The moms stop talking. It's a stony, icy, shocked silence. Every eye in the room is on me and the mess of fruit and juice and pieces of exploded watermelon basket I'm now standing in on the floor. I smile nervously, figuring they'd all realize it was an accident right?, and praise me instead for my big boy idea of serving them in the first place. That's not what happens. Not even close. In what was once a calm, quiet room, all the moms are now running this way and that way, some with kitchen towels wiping juice from the floor and furniture, others with plates picking up fruit chunks from everywhere. I'm standing in the middle of this sudden chaos, and no one is looking at me or talking to me. It's like for them, I'm suddenly not here anymore. I see my mom talking with another mom. "Oh good!" I think, "she's explaining it was an accident, and things will be OK.". Wrong! That's also not what happens. She takes me by the hand (and this time it's not the same loving hand-holding it was when we frolicked on our way here: it's a tight grip, pulling me) and walks me out the door and home. She isn't speaking along the way. This mortifies me. Then she lets go of my hand and walks ahead of me. I follow, looking down, feeling terrible. What I want in this moment is her approval / her love. And she's not giving me her approval. Instead she's walking ahead of me, not holding my hand, not speaking. I want her to make it right. I want her to tell me it's OK. None of this happens. I'm deeply embarrassed. Even at this tender age, I understand I've let her down. In this moment, I add on a meaning ie I commit myself to a life sentence of "She doesn't approve of me" which becomes "the Truth" for me - not only in future encounters with my mom but also with everyone else with whom I interact. I seek approval everywhere. But the life sentence I languish under, ensures I never find it anywhere. This conversation teases out the possibility of telling the truth about the life sentences we impose on ourselves by adding on meaning then forgetting it's we who added on the meaning then living as if whatever meaning we added on is in fact "the Truth". Nothing I made up about my mom not approving of me / not loving me was "the Truth". Yes she was embarrassed by the mess I made (rightly so - so was I). But her embarrassment didn't stop her loving me / approving of me. It was I who put that in play, with the result that any love she showed me was suspicious to me - even worse, any love anyone showed me became suspicious to me too. Having isolated this added-on meaning for myself, I shared it with my mom thirty five years after the fact. I shared how it got in the way of me allowing her to show love for me ie that I was languishing under "the Truth" that she didn't approve of me. And "the Truths" we languish under, even if they're false ie especially if they're false, become real for us. Isolating added-on meaning, causes it to lose its grip, paving the way for free choices, new possibilities, fresh starts, and wide open futures.